The other night I was watching Antiques Road show. 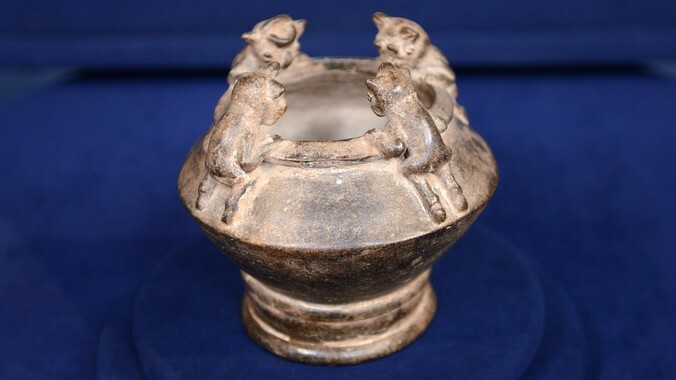 A guest was proudly displaying an earthen pot with four animals crouched around its rim. “This is a classic example of what you think of when you think of Tayrona pottery,” said the expert. There’s Tayrona pottery? 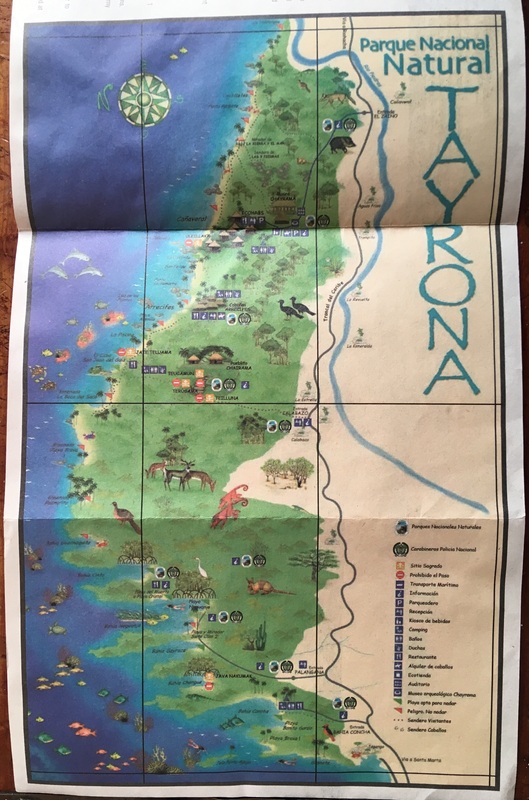 I spent two nights in Tayrona National Park and didn’t know what the “Tayrona” referred to. 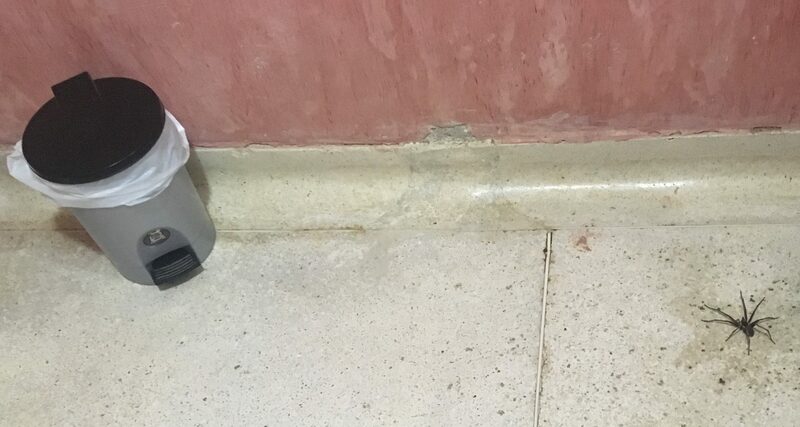 “But the opening is only 4 inches wide, and when I knock on it … here … there’s a hollow sound instead of a solid sound. I’m afraid it’s not genuine,” intoned the expert. Here’s a bit of what my personal librarian, Wikipedia, has to say about the Tayrona—or Tairona—people. So they were still around. I had noticed on the map handed to us at reception that there were villages in the park which were off-limits to tourists. I liked that. It’s a beautiful map. Unfortunately, the type was microscopic so it was only marginally helpful. The compound in which we were staying was called Cabanas Arrecifes. On the way to our hut we walked past an area with permanent tents for rent. 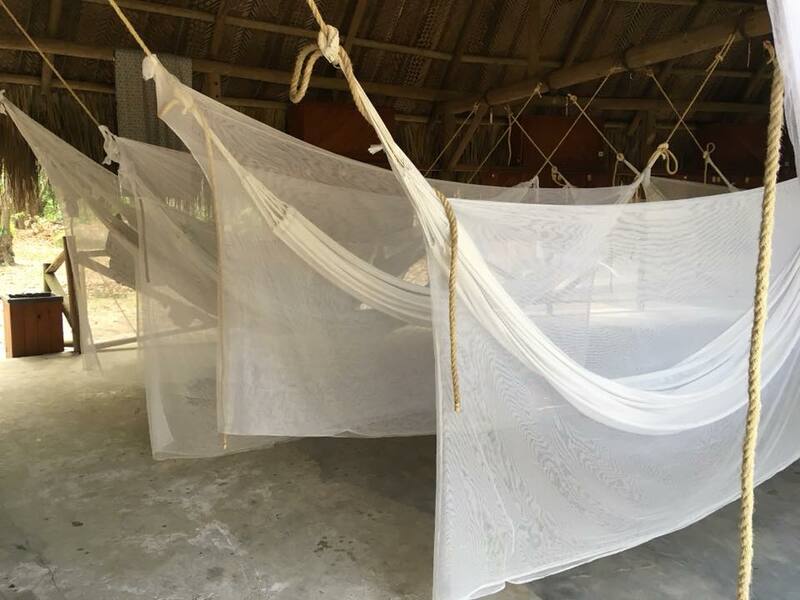 Farther on, there was a big hut with hammocks, also for rent. 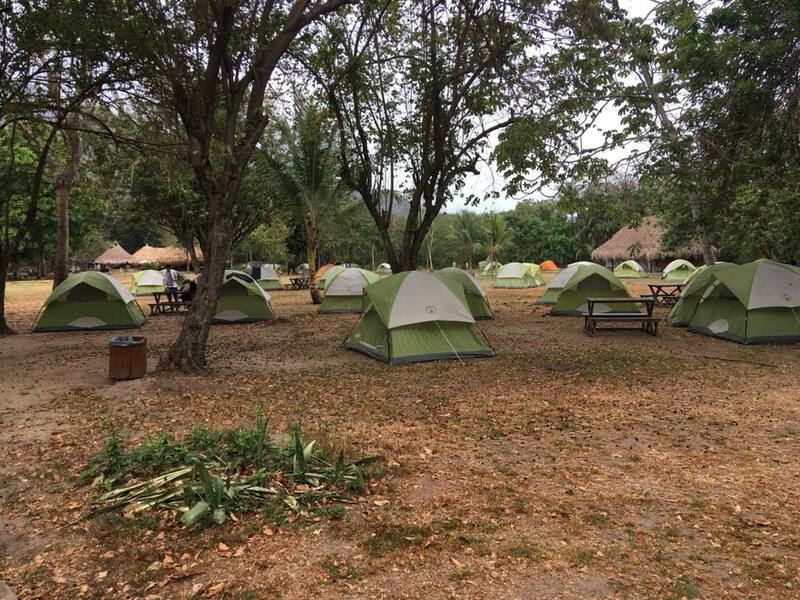 The tenting and hammock options were as basic as they look. After all, it’s a national park. I stepped inside the hut because I’m nosy. Lockers were the one amenity. If I slept in one of these, I’d be unable to stand erect for days. As it was, I worried how I would feel the next day. 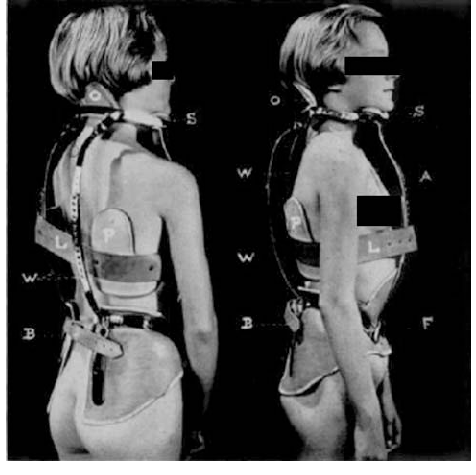 As I’ve written, I have scoliosis, for which I got to wear one of these four years (this is not me; I’m grateful none of the photos of me they took for “research” made it online). One of the activities I was admonished not to do was horseback riding, due to the jostling. Not that my family belonged to the horse-riding set; I did it once pre-brace at Campfire Camp, where I went on a scholarship. 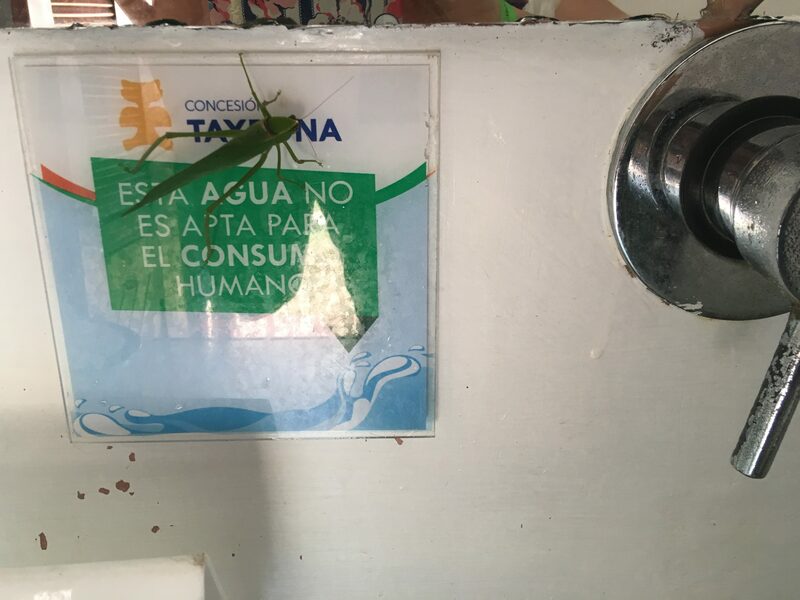 There were communal bathrooms with showers for the tenters and hammockers, but you would definitely want to take a flashlight and wear shoes in the middle of the night to avoid stepping on one of these. That goes for all levels of accommodation; this was in our bathroom in the cabin. I’ve tried to find out how much it cost to book a hammock vs. a tent vs. a cabin, and all that comes up is .com sites that want to book the cabin for $280 a night. Responsible Travel must have an agreement because we couldn’t have paid anything close to that. Two nights at that rate would have been over a third of our price of our entire 10-day trip. There was no Internet in the park, so no way to let Responsible Travel know we’d arrived safely. But they were way ahead of us. Driver? This morning? The morning seemed like two days ago. This entry was posted in Adventure, Budget travel, class divide, Culture shock, Travel and tagged Colombia, Tayrona National Park on May 6, 2018 by Breaking Free.